In a speech before the House of Commons in 1947, Winston Churchill said that "democracy is the worst form of government except all those other forms that have been tried from time to time"(i) and recent events from the British Isles bring those ominously relevant words to mind. On the 11th of May, Tory David Cameron was confirmed by the Queen as the new PM of the United Kingdom ending the hung parliament through a coalition deal with Lib Dem Nick Clegg. Indeed, the identity of the future occupants of no. 10 Downing street has hung very much in the balance as Lib Dem negotiators have spent long hours in talks with both sides. With 306 seats for the Conservatives and 258 for Labour there was no overall majority and the initiative fell to Clegg's 57 Liberal Democrat seat. Although the first-past-the-post system admittedly gives Lib Dems fewer seats than a popular count should suggest and several voters did not manage to cast their ballots due to long queues, this reveals one of the flaws which might have figured in Churchill's mind in November 1947. The basic principle of democracy was perhaps best put into words by Abraham Lincoln in his Gettysburg Address; a "government of the people, by the people, for the people". However, this principle might be unattainable in real life. In the UK some citizens did not get to vote because of queues. Those who voted for the Tories probably did not expect them to compromise on some of their issues or abandon some of their candidates to make room for Lib Dems. Likewise, although many Lib Dem voters will rejoice in the cabinet seats gained, there is bound to be some protests in the electorate of a party which traditionally is more enamoured of Labour than Conservative ways(ii). The rub, though, is that the party, which by the current system got the fewest seats and at least in theory the fewest votes, is the one which decides the immediate political future of the country. William Hogarth's 1758 engraving from "Chairing of the Members"
Admittedly, the UK form of democracy is an awkward one and has been for some time, as the Hogarth engraving above can satirically testify, but this political twist is not exclusive to the isles. In Switzerland for one, the concordance system has lead to constant coalition governments from 1959 onwards (iii). Coalition governments are responses to situations like the British one, where no party gets a clear majority in parliament and must broker a deal with other parties in order to achieve political legitimacy. They occur mainly in states where parliament is elected on a proportional basis rather than through electoral colleges, as is the system in the US. However, a number of issues arise in such a power constellation. One such is the issue of voter fidelity. The coalition government should ideally be composed of as few fractions as possible. This is in order to avoid internal struggles which weaken the government by estranging their electoral bases and leave the coalition open to votes of no confidence. As is the case in the UK, future conflicts on issues like how to deal with the economy and the for now largely ignored issue of voting reforms might estrange voters and leave the road open for a Labour comeback. Another issue which could arise is the one of political effectiveness. While coalition governments perhaps reflect the political composition of the electorate, they also present a veneer of unity. Two outcomes might result from any disagreements within such a coalition; either the issue at hand is not properly dealt with because of internal discussions, often prolonging the government's response time or the issue is not properly dealt with for the opposite reasons. The need to present a united front silences any necessary discussion and leaves the issue haphazardly handled. 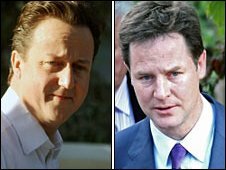 In both cases both government and state suffer from such occurences, and Mr. Clegg and Mr. Cameron will have to tread very carefully to avoid this in the times to come. Finally, coming full circle to what I above defined as the rub, there is the issue of proportional division of power. As I will discuss in the next instalment in this series, as soon as the voter has cast his vote political power has effectively moved from him to the elected representative. This means that ideally decision power in the new government should reflect the populace. In the recent UK election, however, the basics for this decision power proved to lie in the hands of the roughly 7 million Lib Dem voters. They indirectly got to choose whether the voice of the 8.6 million Labour electorate or the 10.7 million Conservative electorate should be the dominant in the UK political future. This way, each Lib Dem voted effectively ended up with more political power than any other voter. What remains to see now is how the Lib Dems will act on issues where they politically stand closer to Labour. Will they openly oppose the Tories or will they bury their hatchet and preserve the appearance of unity? If so, for how long will the hatchet stay buried? In many aspects the political future of the UK now very much rests with the Lib Dems and their disproportionally powerful electorate.